By Antara Dasgupta in Aadhaar Card, Latest News on December 28, 2018 .
uidai.gov.in is the UIDAI Official Website. In order to ensure transparency, efficiency and good governance the government of India has introduced the Aadhaar act 2016. This act was also introduced to ensure targeted delivery of subsidies to the poor and weaker section of the society. The Aadhaar Act also made UIDAI as the implementation agency for allotting Unique Aadhaar Numbers to Residents of India. Keeping these goals in mind the government has made Aadhaar card mandatory in order to avail a number of government sponsored subsidies. Besides this Aadhaar is also used as a KYC document by a number of service providing companies like telecom companies, banks ,passport etc. The Aadhaar Card not only acts as a address proof or but also identity proof. The data is collected by the Unique Identification Authority of India (UIDAI). Based on the biometric and demographic data provided by the individual, the Aadhaar number is issued which is a 12 digit unique number provided to every individual. Rather than searching the the entire city or traveling miles for a Aadhaar center a person can simply visit the UIDAI Official Website to know the nearest enrolment center. Ways of searching the enrolment center. First by state, if a person is traveling or not sure which enrollment center will be nearest to him or her or if in general a person wants to know the enrollment center in his state. Second area wise, if a person knows his or her PIN code of an area then area wise enrollment center can be searched. However if a person does not know the area then he or she can. Now, you will see a date, time and type of all Aadhaar authentication requests made in the period you had chosen. However, the page won’t show who made the requests. You see the full details here. There has been a number of situations when an Aadhaar Card is not delivered to a person after enrolment. In such a case, the Online portal can also be used to know the Aadhaar status. To check the Aadhaar status a person should know the enrolment id, date of enrolment and the security code. The enrolment id and the date of enrolment can be found at the top of the acknowledgment form which is provided to a person at the time of enrolment. Every citizen of India while enrolling for an Aadhaar card is required to provide his or her biometrics which includes fingerprint scan and iris scan. To ensure that the biometric data is safe a person has the option of locking them in online portal. Further, they can unlock it anytime they want. However, it must be noted that the locked biometrics cannot be used by the user for any kind of authentication thus avoiding any kind misuse. In case a person lost his or her Aadhaar card then they do not have to enroll for the Aadhaar card E-Aadhaar is similar to the Aadhaar card a person gets via post. To download the card online one should know the enrolment id or Aadhaar number, PIN code. Further, a person will also have to fill in his name and security verification. In case a person does not remember the Aadhaar number then the enrolment number as well the registered mobile number will have to be provided. The details in the Aadhaar card can also be updated in the UIDAI Official Website. A person a can also update the details by visiting the Aadhaar enrollment but this not only time-consuming but a person is also required to pay Rs 25 to make the updates. UIDAI has made changes to the online tools. As earlier, the subscribers could change or update details such as name, date of birth, mobile number and email address online itself. However, now only address can be updated online and rest of the details can be changed or updated by visiting the Aadhaar Kendra or Aadhaar centre, which is in effect from October 20, 2017. On clicking the link, you will be redirected to UIDAI Bank Mapper’s Portal. Enter the “Aadhaar Number” and “Security Code” displayed on the page. Click on “Send OTP”, an OTP will be received on the registered mobile number. Your linking status will be displayed to you. If you haven’t linked your Aadhaar with your Bank Account. Check out this article on how to link your Aadhaar with Bank account. The UIDAI Official Website along with its features can be used anywhere and anytime in this country, making the lives of the people much easier. Not showing aadhaar and bank link status but have linked my aadhaar card to my bank account. what is the password for open aadhaar pdf? 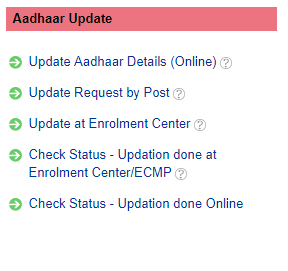 Can i update Aadhaar details online. i need to correct my name in aadhaar card. any latest updates of uidai official website? Aadhaar card download krne ke liye uidai ki official website me option kaha pe h? UIDAI Website Not Opening outside of India? ?